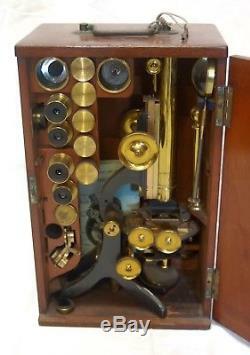 For sale, a cased Challenge model microscope with accessories by Swift & Son of 81 Tottenham Court Road, London. A very good example with numerous accessories. 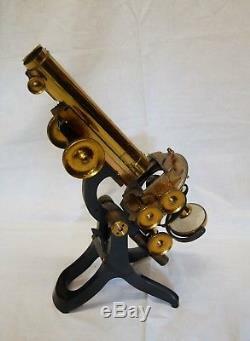 This model was probably better described in Carpenters, The Microscope and its Revelations of 1883. The instrument constructed under this designation by Messrs. Swift, is one of which it may be fairly said that it is surpassed by no other of its price in the excellence of its workmanship, and its suitability to the general wants of the Microscopist. The support on which it is hung is extremely firm and substantial without being heavy; and when the limb is brought to the horizontal position, resting on the cross plate between the two uprights, the instrument is still well balanced. The rack and pinion movement is made with oblique teeth; a construction which favours smoothness and sensitiveness in the adjustment, so that a l/4th inch objective may be focused by it alone. The fine adjustment is made by the milled-head at the lower end of the body. It is a peculiarity in this instrument, which especially fits it for those who work much with Polarized light, that the analysing prism is fitted into the body above the Wenham prism, in such a manner that, when its fitting is drawn out (without being removed), it is completely out of the way of the light-rays; whilst, when the use of the Polariscope is required, the prism can be at once pushed into the body, working in conjunction with the Wenham prism. This mode of mounting the analyser is found to interfere much less with the definition of the objective, than the insertion of it between the objective and the Wenham prism. The stage rotates in the optic axis; and may either bear (as in the figure) a sliding object-carrier, or may be furnished with mechanical actions. The mirror is attached to the stem by a crank-arm, allowing it to be so placed as to reflect light of considerable obliquity. Beneath the Stage is a broad horizontal dovetail groove, into which is very exactly fitted a firm (sprung) slide that carries a Sub-stage for illuminating apparatus, fitted with a vertical rack movement, and with horizontal centering screws; this arrangement devised by Mr. Swift enables the Sub-stage to be placed in position or removed, without disturbing either the stage or mirror. The extremely ingenious Universal Sub-stage combining Achromatic condenser, Black-ground Illuminator, and Polarizer with varied adaptations-devised by Mr. Swift for this microscope, but capable of being applied to any other, will be described hereafter. The Swift company was formed in 1854 by James Powell Swift who had previously worked for the famous optical instrument maker, Andrew Ross. In 1903, Mansell Jamess son, Mansell Powell John Swift also joined the company and just three years later in 1906, the founder James died. In 1912 the firm became incorporated as James Swift & Son Ltd. Both remaining family members died a day apart from one another in 1942 and the firm became a subsidiary of ER Watts & Son Ltd which itself later became Hilger & Watts Ltd after taking over the business of Adam Hilger. 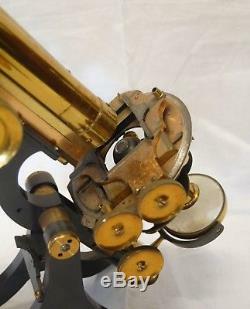 During the period of family ownership the Swifts were responsible for improvements to rack and pinion movements and fine focus systems on microscopes and for bringing the first petrological microscope using fixed stage and revolving coupled polariser analyser to the market. Jason Clarke Antiques are happy to discuss carriage, condition or for any other queries, alternatively, you can also message me and I will endeavour to come back to you as soon as possible. 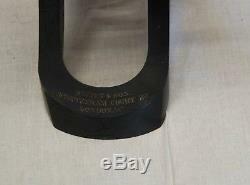 I have a number of beautiful antiques for sale, so please feel free to browse my other items. 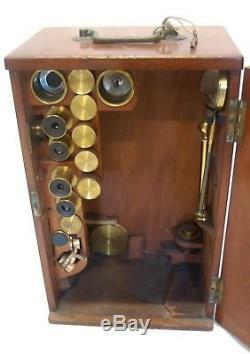 The item "VICTORIAN CASED CHALLENGE MODEL MICROSCOPE BY SWIFT & SON LONDON" is in sale since Wednesday, October 3, 2018.